The selection of tips, which I published on 12.2.and 19.2.2011 (with a success ratio of over 32% profit both times), was based on observations of deviations, i.e. on “errors”, which are completely natural in a row of expected events. The odds makers cannot always fully consider deviations, and therefore, on a long-term basis, there are profitable picks available. By researching and analyzing the statistical trends and then looking more directly at the individual games, it is possible to see deviations from the normal distribution, and from there, obvious “errors” in the odds. This series of articles is concerned with the approach for selecting plays and identifying “errors” in market odds. Also, I publish weekly picks, which are made on basis of this analysis, and expose these errors to a practical test. Odds available in the market are based on the statistical expectation of an event, in other words, the ‘average’ value of historical football match results (= known value). For simplification and explanation, I am now assuming that odds are calculated arithmetically through the season without considering factors such as the strength of the teams involved and any other aspect of the individual match. Certainly this is not how the odds makers calculate their odds. Genuine mathematicians among my readers may shake their heads now, but in the following example I am surmising that the odds for each match are alike during the entire season. Translated into practical application for the bettor either one picks matches where the home team can be laid (not to win) at a price under 1.99 and/or matches where the home team can be backed to win at odds higher than 2.17, in order to make profit every season. As already stated, my example assumes the odds for each match are alike during the entire season, which is obviously wrong. One only needs to consider matches for a single weekend to realize that each game has different odds for the various possible outcomes. Nevertheless, for the general understanding of odds mathematics, I shall retain this obvious implausibility. The English Premier League has 380 matches during a season. If one has a statistically based system, then one must naturally bet on all matches as it is unknown which games will end in a home win, draw or away win. 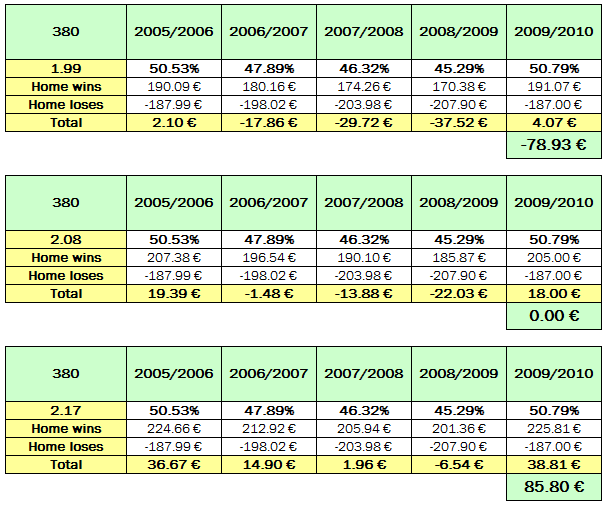 If one lays all the home teams at the minimum odds (1.99), a profit of 78.93 € is made, and only in the years 2005/2006 and 2009/2010 is a loss made. If a lay bet or back bet is put on every home team showing odds equal to the calculated average of 2.08, the result is exactly break-even with exactly 0.00 € profit/loss. If one backs every home team with 1.00 € showing the 2.17 maximum odds, a profit of 85.80 € is made, apart from in 2008/2009 where a slight loss would be realized. Derived rule: One cannot obtain profits on a long-term basis if one only ‘lays’ or ‘backs’ to the average odds (i.e. the statistically expected result). One ‘lays’ if the odds are lower than statistically expected and ‘backs’ if the odds are higher than the average odds. Apologies for such a large quantity of maths and statistics, but I hope very much that this article helps your understanding of bet mathematics. In my next articles I will penetrate more deeply into this subject and will describe how to find market deviations, what conclusions can be drawn from them, and how matches are selected for betting purposes. In order to be able to follow my articles and explanations however, one must perfectly understand the terms average value, errors and residuals (relative and absolute deviation) and the formula for odds computation. Therefore, I implore you all to do your homework and check everything using your own examples and your own preferred football leagues. Hey. i wanna know how I can use probability to predict the putcomes of football bets. Mind showing me how? How can I combine these statistics to get me an idea of expected result. I’ll have to think about that and add your question to the 1×2 course I have been planning to write for a long while, especially the attacking/ defensive rating… No idea, to be honest, because I don’t even know where I could get enough data from to analyse it properly. 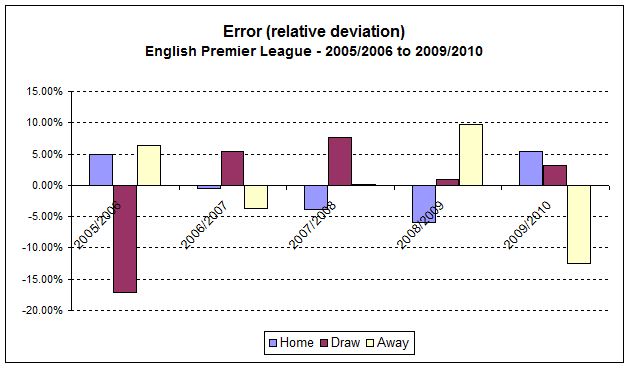 Generally speaking, from a statistical perspective, football matches do not occur frequently enough. For example, looking at a single league such as the German Bundesliga with only 306 matches per season, a relevant sample size is never going to be large. The plain truth is that any football league is simply not large enough to generate a significant amount of completed match statistics per season. This means that the standard deviation (margin of error) is always going to be relatively large…. and attacking/ defensive rating… it’s only the last few matches, isn’t it? I probably wouldn’t burn my fingers with it. Odds and ‘possible outcomes’ are really connected. Bookmakers seldom price ‘true’ probabilities.